Sober party trend allowing people to avoid the bar scene. You no longer need a drink to have a good time. Two companies are now debunking that myth by hosting parties for those who want to put down the margarita. "The fun isn't over, it's only the beginning," said MJ Gottlieb, co-founder of Clean Fun Network. "It's not specially for the recovery community at all. It's for anyone who chooses not to drink or do drugs – whether its religious reasons, or if they just don’t like to drink." Gottlieb's Clean Fun offers unique experiences to sober individuals expanding further than casual meet-ups. The app allows users to sign up for dating, spontaneous get-togethers, and for a premiere club fee, a chance to embark on group trips abroad. "The premiere club runs from $500 to $4,400," said Gottlieb. "Events like trips to Yankee Stadium are $40 to $80. We like to keep it reasonable and affordable." Sober his whole life, Tim DiMartino, 27, of New York said he's willing to give the app a try. "That would be cool because it would put the whole stigma up front saying 'yea, I don't drink, I don't do drugs,'" he said. "When I tell people that at first they say 'wow, how?'" In the past, DiMartino found it rare meeting people who shared the same lifestyle. "Honestly, I was the only person I knew for three or four years who didn't drink," he said. "I'm not a big party-er to begin with. It's just not my scene." Virginia VanAuken, 27, does enjoy the party scene, but like DiMartino, she steers clear of any alcohol. "Throughout my whole adult life I have been to parties or bars and have been the only one completely sober when I was the designated driver," she said. "Now I can go to events and drive home, don't need a hotel, make sure my friends get home safe, and wake up feeling good and with no regrets." Daybreaker hosts parties for people living sober lifestyles. For those who still want to party, minus the booze, the team over at Daybreaker has it covered. Like Clean Fun, Daybreaker hosts events for the conservative crowd in seven cities across the country. For $15 folks can begin their morning with a Yoga session. 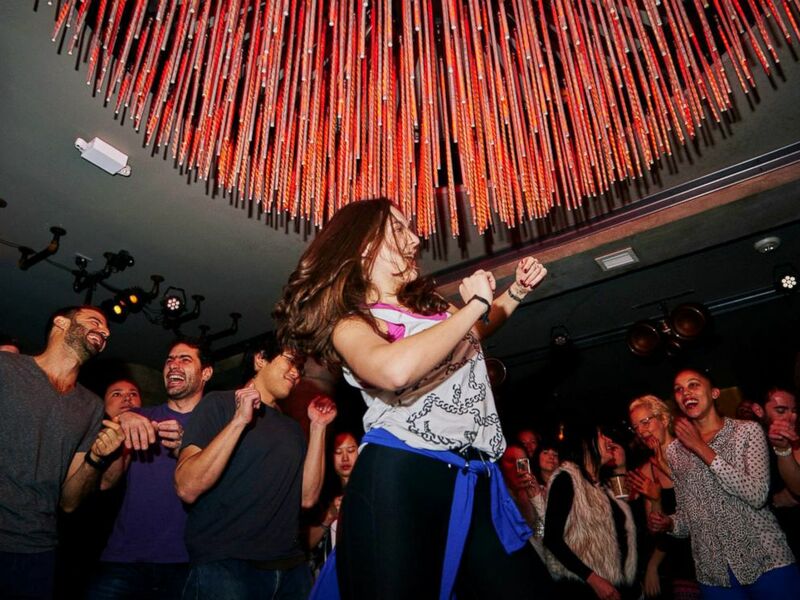 From 7 AM to 9 AM there's a dance party complete with breakfast food, live music, or DJ. Admission is $25 for all. "You don’t want alcohol to start off your day," said Daybreaker co-founder Matt Brimer. "You want something that’s going to wake you up and make you feel good." Currently in New York City, Brimer and his partner Radha Agrawal throw the morning bashes at various locations including art galleries, nightclubs, music venues, and restaurants. "We were frustrated with nightlife in New York because it was either too exclusive, or wasn't inspiring or interesting to us," said Agrawal. "This continues to motivate us in continuing to build sober experiences where people to connect and actually see each other. The problem with nightlife is you're under the influence and you cant really show up as yourself. "By 7:05 the dance floor is filled with hundreds of people. It’s the most energized, alive, connected dance experienced I've ever seen." To receive party notifications, sign up with your e-mail and location on Daybreaker.com.